"To believe in the Day of Resurrection is"The most important article of faith in Islam. It is in fact, the basis upon which Islam builds its whole philosophy of Life... The advent of resurrection or Qiyamah is more frequently mentioned in the Noble Quran than any other happening.”Defended by an impenetrable phalanx of Sure Signs beyond human manipulation, the collective eschatological manifestation of these Sure Signs of the living, breathing Holy Qur'n triggers Allah's (SWT) Decree: "I do call to witness the Resurrection Day; And I do call to witness the self-reproaching Spirit.”May no Muslim/non- Muslim reading this ever deny in the Hereafter that they were not warned that Al-Qiyamah has commenced: "O ye assembly of Jinns and men! came there not unto you messengers from amongst you, setting forth unto you My signs, and warning you of the meeting of this Day of yours?”Qur'n 6.130"
Few today understand what i am trying to say, but the future is promising. So i will try explaining. 16. Move not thy tongue concerning the (Message of the Resurrection), to make haste therewith. This Message and the Resurrection was to be unequivocally reserved for God Almighty and His Ruh to collect, promulgate, recite and explain the Resurrection, and manifest the Sure Signs to support it. There is no ambiguity in the language that clearly forbids any human from interfering with its declaration, manifestation and interpretation —"move not thy tongue"! Over the last few days i am having deeper insights into Islam and the Holy Qur'an, insights never attained before. i know this is the beginning of a new spiritual journey into the living, breathing Qur'an, an absolutely revealed Holy Scripture that is wrongly reviled and maligned by non-Muslims due to religious rivalry, conditionings, misconceptions and ignorance (and vice versa too). But i am going to defend it with all my might and prove to non-Muslims in particular and Muslims in general that the Great News/Event/Message of the Resurrection is ordained for all humanity. Note: The swathe of Islamic nations include those countries with the most Muslims i.e., Pakistan, India, Bangladesh and Indonesia. > nations, a solar eclipse that must be simultaneous accompanied by a > blast in the sky and witnessed by the very person who, accompanied > by His Ruh, claims to have visited Prophet Muhammad! Huda, a Muslim for the past 20 years, is an educator and writer with nearly two decades of experience researching and writing about Islam. She currently teaches elementary school in the Middle East. More than two decades ago the Great Adi Shakti announced that Shri Jesus Christ was born on the eve of Diwali, the Hindu new year, and not the 25th of December. 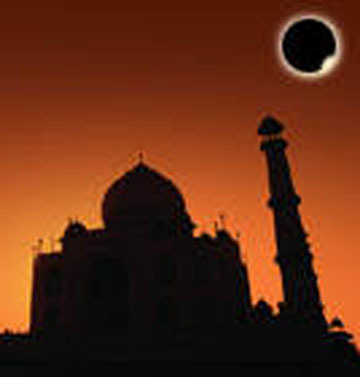 The total solar eclipse of October 24, 1995 is the first to fall on Diwali since 1762. 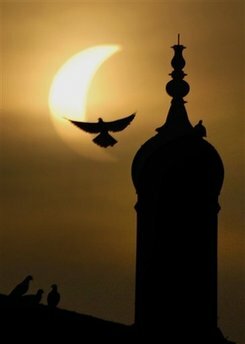 The timing of the solar eclipse taking place simultaneously on Jesus Christ's date of birth (Christianity), the beginning of Qiyamah (Islam), and the New Year (Hinduism) is truly Divine Intervention: It has taken place for the first time ever in the history of this universe. This being the case, then the extremely rare solar eclipse on Diwali— the actual birth date of Jesus Christ—has immense importance because the Qur'n procliams that"He (Jesus) is the Sign of the Hour (of Resurrection)"- Surat az-Zukhruf 43:61. The total solar eclipse on the Diwali day of October 24, 1995 not only confirms that Sign but also brings harmony and unity to the great religions of Hinduism, Christianity and Islam. v. That the event happens through the messenger and no one else. Shri Mataji: "But the Muslims do not want to talk about Resurrection at all because they want to frighten people with the Doomsday"
1400 years ago Abu Musa narrated that"The sun eclipsed and the Prophet got up, being afraid that it might be the Hour (i.e. 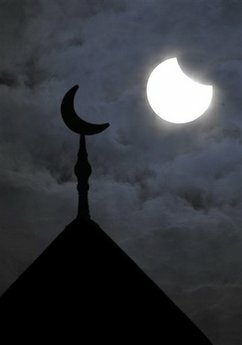 Day of Judgment).” Prophet Muhammad was revealed that a certain solar eclipse will trigger Al-Qiyamah (surah 75). We hereby declare to the Ummah that—backed by His irrefutable Sure Signs, and the collection, promulgation, recitation and explanation of the Great Event by His Ruh Shri Mataji—it is the solar eclipse of October 24, 1995 that commences the Hour of Resurrection and Judgment. May you never ever deny this Great News and Warning in the Hereafter! "In between Jesus Christ and His destroying Incarnation of Mahavishnu called as Kalki there is time given to human beings to rectify themselves, for them to enter the Kingdom of God which in the Bible is called as Last Judgment—that you will be judged. All of you will be judged on this Earth. The population of the Earth is at the maximum these days because all those—practically all those who had aspirations to enter into the Kingdom of God—are born in Modern Times and are going to be born very soon. This is the most important times because Sahaja Yoga is the Last Judgment. It is fantastic to hear this but that's the fact. It's the Truth! And to all His Servants who have surrendered to His Call of"I do call to witness the Resurrection Day; And I do call to witness the self-reproaching Spirit", every October 24 will be celebrated as the Day of Al-Qiyamah (The Resurrection). As Prophet Muhammad has revealed: "But Allah warns His servants through them.” i believe one day it will be one of the most celebrated and holiest of days, a clear reminder that humanity has entered the grace period (Al Qadr: The Night of Power) prior to the End (Al Qariah: Day of Noise and Clamor).